Vorshlag has long promoted that you can never have too much camber in your McPherson strut suspension. For the S197 Mustang, which has 1000 pounds on each front corner, this is especially true. 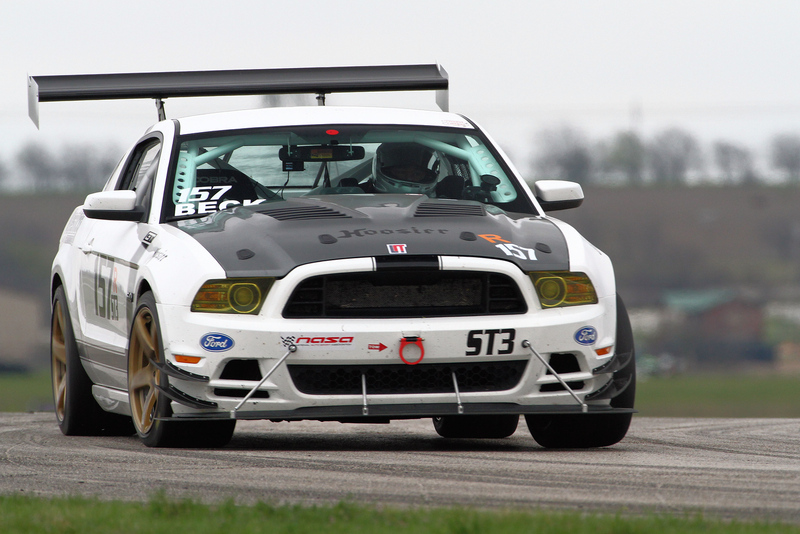 When customers are buying our 11" wide wheels we assume they are for track or competition use. These big wheels hold big tires, which make big grip numbers, and as suspension loads go up the squishy bits (bushings) tend to move around more. This further drives up the need for more static camber, to -3.5 or even -4.0° up front. The problem is that the strut tower opening is very small on this chassis (the hole is only 1.8" diameter). 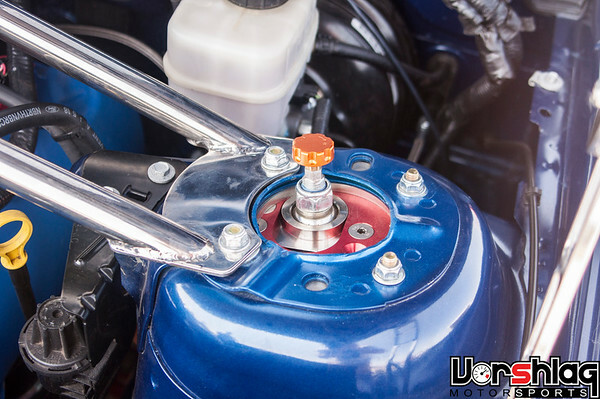 So even with our camber-caster plates, you might not be able to get to the ideal camber setting with some ride heights or strut brands, as the strut shaft will run into the opening at the strut tower. You may have to cut the tower opening to get the adjustment your tires need. 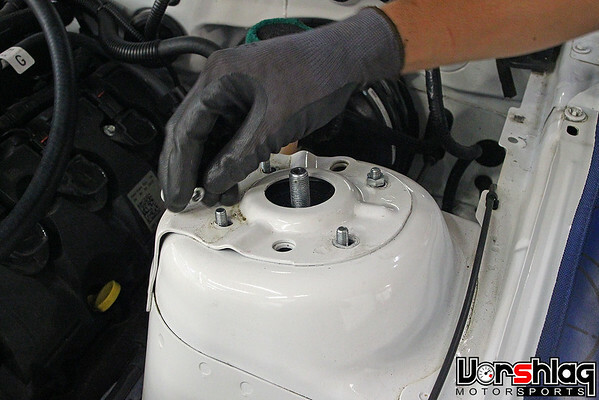 Many people enlarge the strut tower openings to allow more adjustment range, which many camber plates allow. 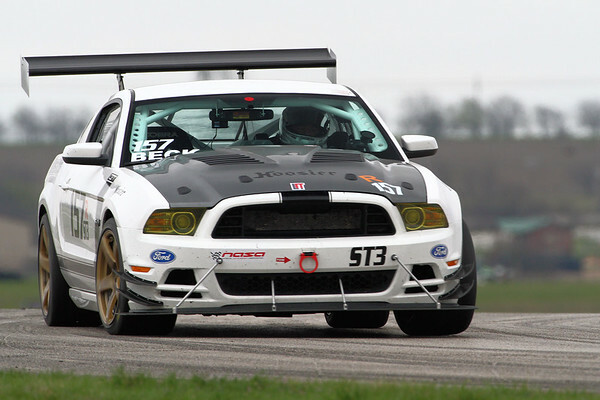 Even the Boss 302-S race cars had the towers cut to allow for more camber travel. And if you want to run any additional positive caster, this way you won't lose camber adjustment. Some people have really hacked up towers - with a Dremel or saws-all - or made some hole saw drilling fixture out of a block of wood, which is easy to get started wrong and end up with a hole that is off-center. This is where the Vorshlag Strut Tower Cutting Fixture comes in! 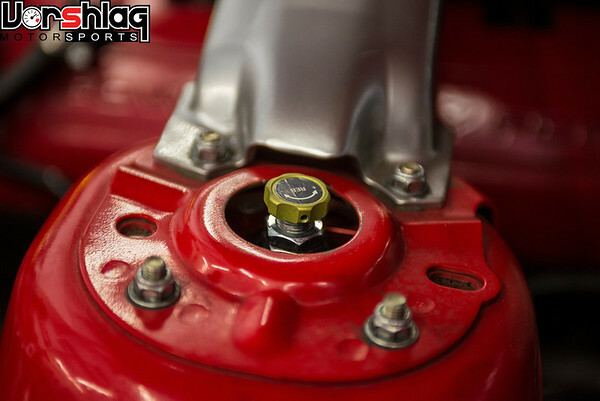 This tool bolts into the S197 strut tower from underneath to align the cut. These are CNC cut and welded together on a production fixture, at our facility. Bolt it in, line up your hole saw bit, insert a 2-1/2" hole saw with a 1/4" arbor bit into the fixture, and cut down towards the plate. The raised centering bushing lines up the cut so it is never off-axis. You should be able to use this tool dozens of times, and you might scuff the jig from the saw touching the plate, but it's 1/4" steel and can take a beating. The fixture comes raw and unpainted - we are trying to keep costs low. You supply the top nuts, the hole saw, and use a 1/4" bit for the arbor. Don't worry, we've done this cut on dozens of cars for many years, and have not seen any weakness in the multi-layer towers on these cars. A 2-1/2" saw leaves a curved ridge around the opening for strength. We've even seen people use a full 3" hole saw and cut all of the raised portion away, with no issues like the photo above. This link shows how to use a similar fixture in the S550 chassis. It works the same way in the S197.